Here at City Tavern, we LOVE dogs. We even have resident bar hounds, meet Alfie, Hector and Dillon. One of whom will be in the bar each day. City Tavern is very dog friendly, we have plenty of water bowls and a stock of very special gourmet dog treats. Please feel very free to bring your well behaved dogs along. Hoonds have always been welcome! Really dug friendly, recently refurbished local pub. So dog friendly they went to rescue centre for their own pub dug….and came back with a tortoise!! 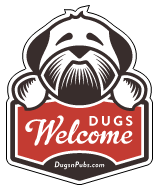 There are a total of 16 dog friendly listings in the Newcastle Pubs category. Please log in, or sign up as a member to view all listings.